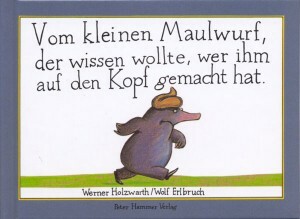 This charming book by Werner Holzwarth and Wolf Erlbruch, which I bought in Zurich, cleverly presents its theme on the cover as a title: “Vom kleinen Maulwurf, der wissen wollte, wer ihm auf den Kopf gemacht hat”. Egils translates this as “From small Mole, who wanted to know who dropped this thing on his head.” It seems that our hero stuck his head above ground to feel the warmth of the sun when something brown and shaped like a sausage dropped onto his head from above. The little Mole was quite insulted and determined to discover who was responsible for inflicting this turd upon him. When a dove flew over, he asked her if she was responsible and she replied “I? No, why? I do it so!” and then demonstrated her white, moist type of emanation, some of which splashed onto small Mole’s foot. He then asked a horse, then a hare whether they had dropped this thing on his head and each repeated “I? No, why? I do it so!” then demonstrated their own droppings, complete with sound effects. 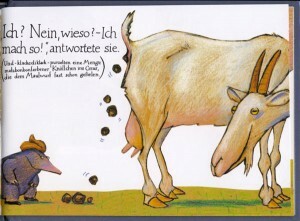 When he asked the goat, she gave the familiar refrain, then what rained down looked to the mole a bit like chocolate truffles. The pig revealed his own personal, aromatic style. The cow also obliged by expressing her own voluminous effluvium, which inspired the small mole to feel grateful that hers was not what had landed on his head. The small mole was still clueless about the perpetrator until he encountered two flies. They obliged him by sitting on his “hat” and taking samples. Their ubiquitous experience in dung revealed the culprit. It was a hound! 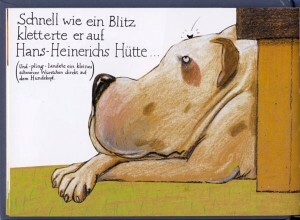 Small Mole marched over to Hans-Heinrich the butcher’s dog. Small Mole climbed atop the doghouse. Then a small dark, sausage-like something dropped directly onto the hound’s head. 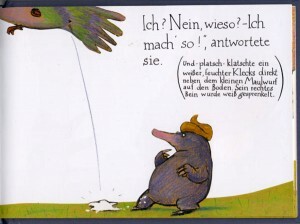 The last page of the story shows small Mole escaping down into the earth, satisfied at last. Like the intrepid Mole, this book is small – only 6” x 4 ½”. But it is not insignificant, as it is a humorous depiction of a most universal subject, drawn with artwork that is intimate and elegantly simple. The hand drawn text is readable and divided into the main story line, then in parentheses are descriptions of the sounds and smells of what is happening. Together the theme and story, lettering, art and design make the book larger than its size. As if the mini scale, droll artwork and intriguing cover were not enough of a marketing tool, the final spread shows a series of other books written by Wolf Erlbruch, also published by Peter Hammer Verlag. Altogether a nifty package. This entry was posted in children's books, reviews, Uncategorized, World of Books and tagged book art, children's books, marketing, world books. Bookmark the permalink. Post a comment or leave a trackback: Trackback URL.